With over 50 years of combined experience, our certified designers will help you every step of the way making sure you receive the best window treatment to perfectly complement your room. We are proud to only use in-house certified professional installers. Conveniently located across from Sheridan Village (on the corner of Sheridan Rd and Lake St), our Gallery showroom displays a wide range of Hunter Douglas products hand selected by our designers. You will be able to see all of the products Hunter Douglas has to offer showcasing various operating systems, colors and textures. We offer free on-site consultations where our staff will guide you in your window treatment selection. Looking at light control, function, privacy needs, pet and child safety and budget, we strive to choose the right window treatment for your home. Using hand samples and our iPads, we are able to show you what your treatment will look like before it is installed. With PowerView® Motorization from Hunter Douglas, you can control your motorized blinds and shades in a variety of ways. Use the Pebble® remote, your smartphone or tablet, or even your voice with a whole-home automation system. Stop by one of our showrooms today to learn more about this revolutionary operating system and how it can benefit your home. Explore creative ideas and smart solutions for your windows with our online brochure. 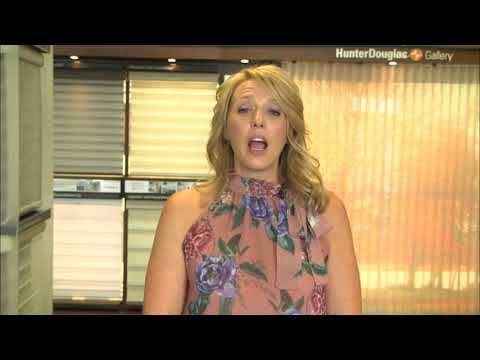 It's the ideal introduction to Hunter Douglas window coverings, available at SunGard Window Fashions. SunGard Window Fashions offers a large selection of custom Hunter Douglas window treatments, including sheers and shadings, honeycomb shades, shutters, horizontal blinds, vertical blinds, Roman shades, roller shades, and woven wood shades. We proudly serve all of Central Illinois. Please contact us, and let us know how we can help you. Recently, our owner and expert designer Alishia Greene was featured on the local Real Estate Talk Show "On The House." Listen to the interview here!